Xiaomi finally decided to bring good sets of cameras in the budget series with Redmi Y2. The smartphone comes with a decent camera sensors on the back as well as on the front. In terms of performance, it&apos;s still rocking the latest processor giving decent performance. The build quality is the only problem you&apos;re going to see in the devices. The latest camera focussed smartphone from Xiaomi. The device gives solid performance and has decent cameras considering the price point. The battery life is killer like any other Redmi device. A great device with affordable price tag. Xiaomi redimi Y2 is a perfect phone for you if your looking for a mid range phone with amazing camera. I am a photography enthusiast and my parents gifted me this device. It has a very good display, the rear camera performance is also exceptional but the low light photography could have been a little better , then the battery life is also decent enough as it can easily last for a day. 4 Pricebaba users have written their experience with Xiaomi Redmi Y2 64GB. 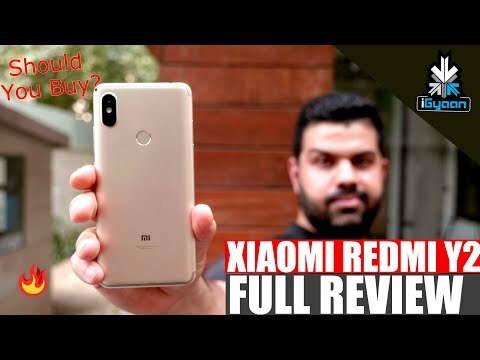 If you own Xiaomi Redmi Y2 64GB, please do leave your feedback too. Lowest price of Xiaomi Redmi Y2 64GB price in India starts at Rs. 10,599 Xiaomi Redmi Y2 64GB is available on Flipkart at Rs. 10,990 and on Amazon at Rs. 10,999. Prices updated on 21st April 2019. On the front, the Redmi Y2 rocks a 5.99-inch bezel-less display bearing a FHD+ display resolution of 1440 x 720 pixels. It roughly translates to 230 PPI pixel density. The back of the phone houses a fingerprint scanner. Sensors on the phone include accelerometer, proximity sensor, magnetometer, & gyroscope. The Redmi Y2 ships in three attractive color variants i.e. Dark Gray, Gold, & Rose Gold. In the camera department, the Redmi Y2 sports a dual rear camera setup comprising of 12MP & 5MP sensors assisted by an LED flash. The camera PDAF system and AI technology for clicking better pictures even in low light. The main highlight of this phone is the 16MP front camera with f/2.0 aperture and a front LED flash for selfie enthusiasts. Xiaomi has added the AI portrait mode which shoots better selfies with bokeh effect i.e. blurring the background and focusing more on the subject. The front camera also doubles up as face recognition for unlocking the device. In terms of video recording, the resolution is limited to Full HD i.e.1080p. Under the hood, the Redmi Y2 is powered by a 2GHz Qualcomm Snapdragon 625 octa-core processor. It packs 4GB RAM and an Adreno 506 graphics processor onboard for smooth multitasking and gaming performance. Storage-wise, the device offers 64GB internal memory. It can be expanded up to 256GB via microSD card slot for additional needs. On the software side, the Redmi Y2 runs on the latest Android 8.1 Oreo OS with Xiaomi’s custom MIUI 9 skinned on the top. The custom ROM offers customization options. There is an IR Blaster which lets you connect the phone with home appliances like TV and air conditioners. The Redmi Y2 runs on a 3080 mAh battery unit. It functions as a dual SIM smartphone and requires nano SIM cards. For networking, the device offers all the basic connectivity options like 4G LTE, 3G, 2G, WiFi, Bluetooth & VoLTE.